Not so many months ago, Americans watched the current Administration create an intentional alliance with Iran, perhaps the greatest threat in the Middle East, and certainly the most vocal enemy of America. Those on the right bellowed a righteous, slack-jawed “what are you possibly thinking?” while many on the left hemmed and hawed searching for a sliver of reason from which to jabber their toe-the-line support of the move. That a godless Administration, overseeing an increasingly wicked government, would create such an alliance – not to mention patently paving a way to nuclear weaponization for them – should not be surprising, perhaps, to the astute student of Scripture. In the total depravity of humankind, reason, logic, and truth do not improve. Per God’s design, the second law of thermodynamics isn’t merely a reality for the physics of the universe. Degradation is also the imminent process for a fallen humanity. Not a surprise. But when Russell Moore, President of the Southern Baptist Convention’s Ethics And Religious Liberty Commission (ERLC) chose to join hands with Muslims, the move was seen with similar “what are you thinking?” eyes. How can a man, single-handedly, in the name of the largest Protestant denomination in the nation, decide to align that denomination with what most of its members would easily identify as the very religion of evil itself? The move to align the SBC with a lawsuit in support of Muslims who had been denied, in legal proceedings in a local New Jersey township, the right to build a mosque is defended by Moore on the grounds of religious liberty. His penned response, from his personal blog site on June 9, is entitled Is Religious Freedom For Non-Christians, Too? Moreover, the idea that religious freedom should apply only to Christians, or only to religious groups that aren’t unpopular, is not only morally wrong but also self-defeating. A government that can tell you a mosque or synagogue cannot be built because it is a mosque or a synagogue is a government that, in the fullness of time, will tell an evangelical church it cannot be constructed because of our claims to the exclusivity of Christ. Harris, though, cites several sources, including a sitting U.S. Representative, that Islam, while veiled in a religion-like veneer, is fundamentally a geo-political ideology. Islam is driven by a desire for geographic conquest, through political and militaristic, even subversive, mechanisms in order to establish the rule of Sharia across the planet. This system of Islamic law is viewed by any reasonable person, believer or not, as thoroughly abhorrent, civilization-destroying, and medievally murderous. As quoted in Baptist News Global, Harris queried the wisdom of Moore aligning the SBC with Islam. This reflects the fundamental issue that seems to elude Moore. The battle isn’t over whether religious liberty is a noble American cause to defend. The question is whether Southern Baptists should defend it indiscriminately, particularly by aligning with the most vocal opponent of Christianity on the planet. In a more immediate context, Harris posits another obvious question, especially for Georgia Baptists recently facing a battle over religious liberty legislation in their own state. Indeed, the very Mission Statement of the Ethics And Religious Liberty Commission says nothing about commissioning its president as a no-holds-barred, and discernment-free, agent for religious liberty. Nowhere does Moore’s own mission statement suggest, or require, that he make what amounts to nothing less than an unholy alliance with the very face of evil on the planet. Surprising as it may be to some Southern Baptists, Russell Moore’s seemingly ubiquitous presence in the national media as a spokes face for religious liberty is not the primary task of the ERLC in its own mission statement. Below, in its entirety, is that mission statement. See if you can remotely align Moore’s behavior with the charged task of his agency. Specifically, the ERLC “exists to assist the churches” – not mosques, mind you – with a quad-pointed outline of ERLC ministries, each notably penned with the opening phrase, “Assist Churches.” It seems rather hard, does it not, to reconcile mosque-building with helping churches. 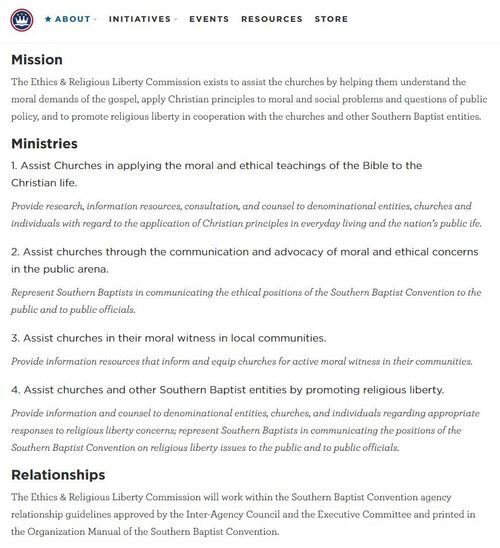 Indeed, in the case of Georgia Baptists, as Harris points out, Moore nor his agency engaged in helping “to promote religious liberty in cooperation with” Georgia Baptist Churches. But Moore certainly found time to jump to the aid of Muslims denied a building permit. Moore’s defense of religious liberty in his blog isn’t the issue. The question is not whether Southern Baptists should defend this right. The question is should we not be extremely cautious, guided by well-discerned, Scripturally-guided discretion, as to how and with whom we align in pursuit of religious liberty? We live in a world where the prevalent view is that there are many paths to God. Why add our name to a list of heretical foreign gods in defense of building a temple to evil, and thus forsake our Gospel witness? Is our trust in the liberty guaranteed by a government somehow more valuable than the promises we know to be real from the Author of Liberty? From a purely legal, first amendment perspective, there seems little restriction in America that precludes Muslims, or Sikhs, or atheists, or whomever from seeking freedom in the name of religion or no religion. But from a Gospel perspective, is it necessary for Southern Baptists to align with evil so that God will protect our freedoms? The upcoming annual meeting in St. Louis would be a great time for Southern Baptists to debate whether we could do much more with less Moore. If it’s deemed necessary to keep intact this lobbying arm of the Convention* then perhaps we should, at least, put a leader in place that will actually endeavor to fulfill its mission to the churches. It’s a worthy mission – if we had someone to do it. * – The 2014/2015 Budget – funded by tithes and offerings – of the ERLC is $3,530,395. How many missionaries could be supported with these funds that, instead, went to support such things as mosque building?